乾的珊瑚草沖掉鹽巴，再泡水至少三个小時（如果喜欢软一点，就泡久一些）。泡好的珊瑚草會呈透明狀。每小时换 一次水。Rinse the salt off from the dry coral seaweed. Soak the seaweed in clean water at least 3 hours until it turns transparent. (If you like softer version, soak for longer time). Change water every one hour. 煮滚二公升的水。加进冬瓜糖，红枣和龙眼干，小火煮一个小时。Boiled 2 litres of water. 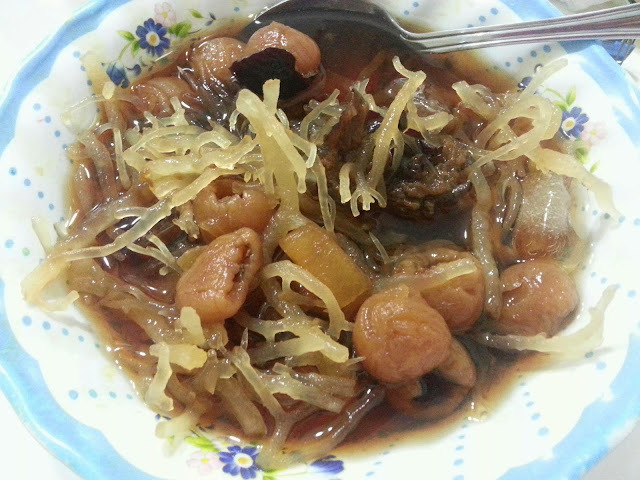 Add in winter melon sugar, red dates and dry longan and cook for an hour At small fire. 把#1 切成小块，待#2 凉了才加进去。Chop #1 to smaller pieces. Let #2 cool down 1st then add in #1.